Reclining on my sofa I stole occasional glimpses out the window in between chapters; Denver was getting dumped on by Mother Nature in a serious way. Approximately 20″ of snow covered the ground outside my home and it was still coming down. 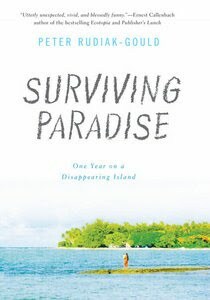 It almost seemed masochistic to read Peter Rudiak-Gould‘s first book, Surviving Paradise: One Year on a Disappearing Island, about his time spent teaching English in the tropical Marshall Islands. Rudiak-Gould traveled to Ujae, a Marshall Island, where he spent a year teaching English to the students of a country with a less than ideal educational system. The idea of teaching English abroad like this is something I’ve toyed with for quite some time, so I was thrilled at the opportunity to read his book. Unfortunately I could never have predicted the irony of reading it in the middle of a blizzard. Despite being taunted by the tropical tale as I tried to stay warm, I quite liked the story. I was consistently engaged as Rudiak-Gould described how he was dropped into a culture he knew very little about, while also forgetting the ever-important bottle of sun tan lotion in a bag he couldn’t quite fit in the plane. As I read his complimentary copy I had very little sympathy for him though as the snow pounded against my window reminding me that I was presently as far from the Marshall Islands as possible. The stories related in the book during the year Rudiak-Gould lived on the island are quite interesting and often times humorous. The vivid descriptions of his experiences made me feel like I was right there watching him learn to spear fish or teach his lessons. Honestly though, the story of an illness possibly caused by a demonic curse was probably my favorite. The tale of the illness though brings about the book’s sub story: global warming is causing the islands to disappear. As the polar ice caps melt the ocean levels rise and thus flood the islands. I took a contrary look to this idea at the blizzard outside my window, but there’s no denying what’s happening to our environment and Rudiak-Gould does an excellent, albeit subtle, job bringing this home. I recommend this book to anyone, particularly those interested in traveling or the environment. It’s a well written story that I had difficulty putting down, which is why I suppose it’s one of the only books I’ve ever read straight through in a day. To pick up a copy of the newly released book for yourself, feel free to use the Amazon.com affiliate link on this page as it’s conveniently listed here.